The first of three Sealab II teams. Former astronaut Scott Carpenter, team one leader, is second from left in the front row. Living underwater might seem like the stuff of a Jules Verne story or a popular TV cartoon. But fifty years ago, 28 Navy aquanauts did just that, as part of the Navy’s groundbreaking Sealab II project. 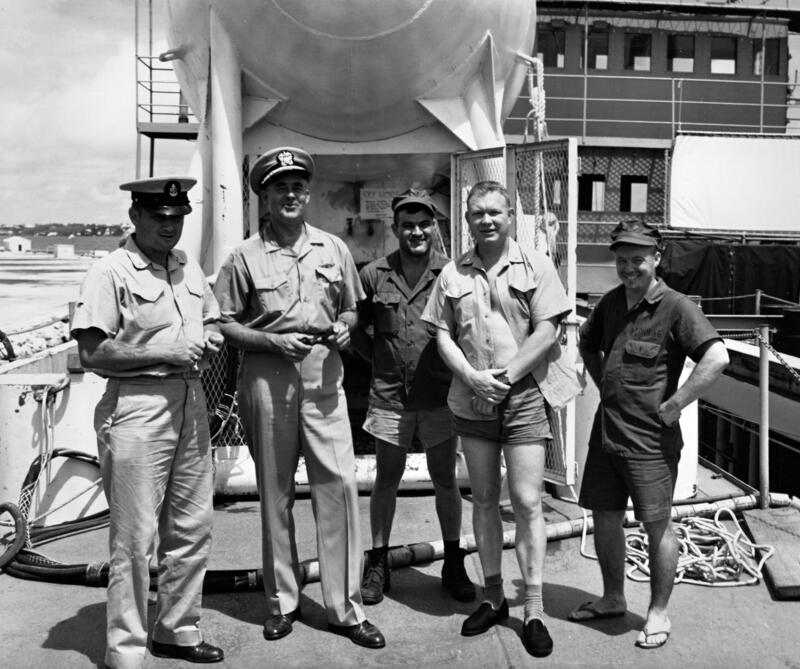 The undersea equivalent of the 1960s space race, the Navy’s three Sealab experiments were the brainchild of visionary scientist Captain George Bond. Dr. Bond wanted to find an alternative to standard surface-supplied diving that often required divers spend hours decompressing for a few minutes of bottom work time. He thought the answer might lie in the untested concept of saturation diving, which kept divers underwater for days or weeks while only needing one decompression period. Bond and his investigative cohorts, Dr. Walt Mazzone and Dr. Robert Workman, initially tested his ideas on land, placing rats, goats, and eventually people in a decompression chamber at the Navy’s Submarine Medical Research Laboratory. Diver Bob Barth, the only aquanaut to participate in every step of Bond’s experiments, received the unenvious task of walking the goats around the base to watch for signs of decompression sickness (a reminder that Navy work is often less glamorous than it might seem). 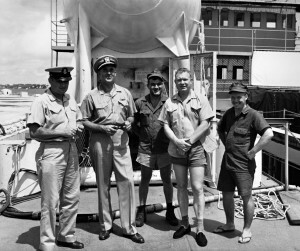 Sealab I aquanauts pose with George Bond, 1964. From left to right: Bob Barth, Bond, Lester Anderson, Dr. Robert Thompson, and Sanders “Tiger” Manning. The success of these land trials, dubbed Project Genesis, paved the way for the first real-world test, Sealab I. In July 1964, Bond and Mazzone sent four aquanauts to 192 feet to live in the 40’ x 9’ steel habitat frugally fashioned from two old minesweeping floats. The four divers carried out oceanographic research tasks for eleven days, working longer and deeper than anyone ever had before. Bond ambitiously upped the scale with Sealab II, planning a 45-day project with three teams of ten divers spending 15 days each in the new habitat. 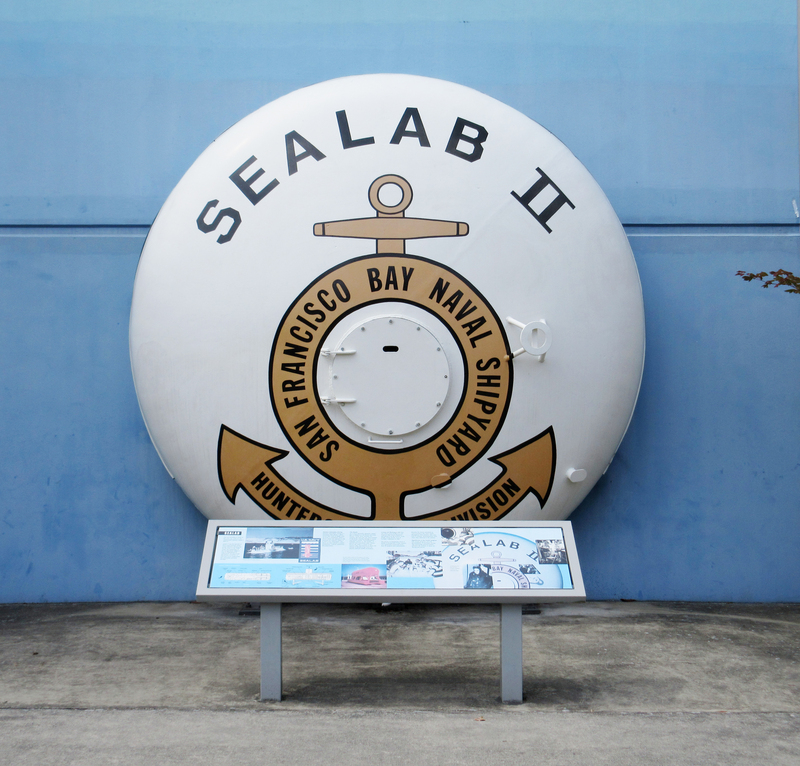 To better emulate the realities of military diving, Sealab II was placed on an undersea canyon ledge in murky, cold waters off La Jolla, California. (The ledge positioning, unfortunately, gave the habitat a decided tilt that sent objects sliding, prompting one of the aquanauts to christen it the “Tilton’ Hilton.”) Compared to the simple, cramped design of the first Sealab habitat, Sealab II was positively palatial with its spacious sleeping and eating quarters, dedicated science lab, and amenities like an exterior shark cage and coral-colored curtains on the habitat’s 11 portholes. On August 28, 1965, the first ten divers swam down 205 feet to Sealab II, led by Mercury 7 astronaut-turned-aquanaut Scott Carpenter, who would spend 30 days underwater as the leader of two teams. True to Navy tradition, the days began with Reveille at 0700 and ended with Taps at 2200. Bond kept the aquanauts busy in between with 24-hour watches and 46 science experiments spread among the three teams. After 10 days of tasks like salvage projects, mining experiments, and deep-water excursion dives (punctuated by constant blood draws and physical performance tests), each team would return to the surface for a 30-hour decompression. Soon after the third group finished on October 10, the entire Sealab II team was awarded the Navy Unit Commendation — the first time it was given to a mixed military and civilian scientific team. 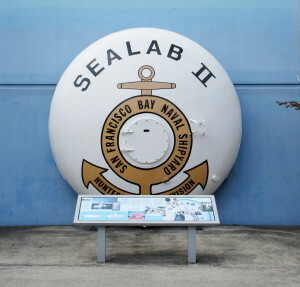 The only surviving piece of the Sealab II habitat, one of two domes that capped the habitat body, on display at the Naval Undersea Museum. The final Sealab experiment, intended to send five teams to 600 feet deep in 1969, was cancelled after aquanaut Berry Cannon died during a preparation dive. 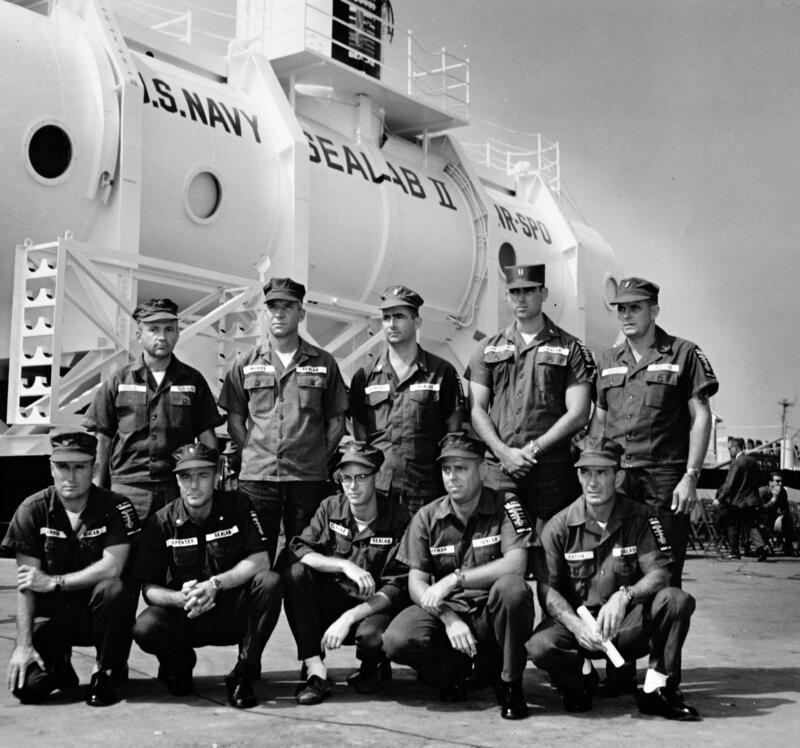 Despite the program’s early end, the Sealab experiments proved saturation diving was a game-changer in the world of underwater work. Perhaps no statistic illustrates that point better than this one: all told, the 350 hours of bottom time (in-water work) done by the Sealab II aquanauts required 12 collective days of decompression. Decompressing after 350 hours of surface-supplied bottom time? That would have taken five years.